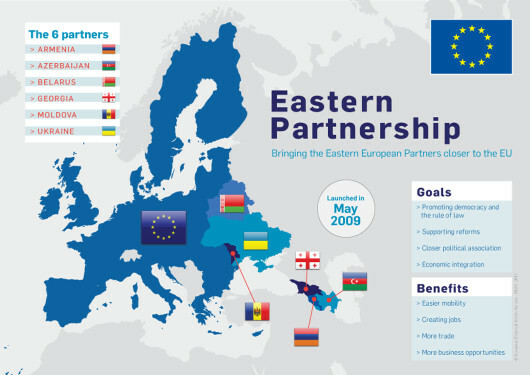 The Eastern Partnership (EaP) is a policy that aims to strengthen political and economic ties between the EU, its member states and six eastern European partners: Armenia, Azerbaijan, Belarus, Georgia, Moldova and Ukraine. It is based on a commitment to the principles of international law and fundamental values - democracy, the rule of law, human rights and basic freedoms. It also encompasses support for a market economy, sustainable development and good governance. A joint declaration signed in Prague in May 2009 first established the Eastern Partnership (EaP) and put forward concrete ideas for enhancing the EU's relationship with the region, including in the field of home affairs and justice. Subsequent summits - in Warsaw in September 2011, in Vilnius in November 2013, in Riga in May 2015 and in Brussels in November 2017 - considered the progress achieved in the framework of the Eastern Partnership and named priorities to improve the cooperation. The Eastern Partnership Summit Declaration, agreed in May 2015 in Riga, reviewed the cooperation and provided the direction for further joint action. The most recent Eastern Partnership Summit, held in Brussels in November 2017, followed the full entry into force of the EU's Association Agreements, including Deep and Comprehensive Free Trade Areas, with Georgia, Moldova and Ukraine. In the summit's final declaration, the partners reconfirmed their commitment to the Eastern Partnership. Heads of state and government stressed in particular that they looked forward to strengthening cooperation in the area of mobility. Important developments for Belarus were also noted in the summit's declaration: EU-Belarus cooperation has intensified. This has created opportunities to integrate Belarus into the EU's economic space, including through joint infrastructure and energy projects in Belarus, which could be advanced with loans from European financial institutions. A new Enhanced and Comprehensive Partnership Agreement with Armenia was also signed at the Brussels summit, and leaders took stock of the ongoing negotiations on a new agreement between the EU and Azerbaijan. The 2017 summit focused on a series of concrete deliverables, which can be achieved in the short and medium term. These were intended to particularly benefit the citizens of the Eastern Partnership countries. Another question also remains a topic of great interest, and is often posed by the EU's associated partners: What comes after association? The official launch of the Eastern Partnership in 2009 grew out of an earlier desire to strengthen connections between the EU and the eastern countries of the EU's European Neighbourhood Policy. Below are some of the key texts produced in the process.